This page is for the original Quake. For Valve's GoldSrc multi-player remake, see Deathmatch Classic. Vanilla Quake sometimes has trouble running on modern machines. It is recommended to use one of the numerous Source ports. bit7.org/quake (archived) - Community site with extensive mirrors section, reviews and details on editions of the game. Inside3d - The modder hub, QuakeC tutorials and an active forum. Quaddicted - Great collection of categorized and rated single player maps as well as a ton of general information and history. QuakeOne - Original network style multiplayer hub, player community. QuakeWorld nu - QuakeWorld multiplayer hub, competitive player community. Video guide for the basics of setting up Quake with a modern engine. Technical information file about Quake from id Software. Without modifications CD is required for in-game music. The only official Linux retail release was part of the Quake: The Offering collection in 1999. Quake: The Offering. Pre-packaged with nGlide (GLQuake) and DOSBox (software mode). Due to legal reasons, the in-game soundtrack in .ogg format is excluded, but is still included as disk images. Does not come with game soundtrack; see Restore music playback. Also, the version of GLQuake included (v0.95) is outdated. See GLQuake for a download link of the latest version (v0.97). The Quakespasm icon is higher quality icon faithful to the original. An extra episode created by MachineGames and released for free as a gift for the game's 20th anniversary. Considered semi-official. Several unofficial add-ons were also released. Full list available here at the Quake wiki. Quake: The Offering includes the base game along with all expansions. Qtest A technology test released on February 24, 1996, a few months before the full release. Meant to showcase the multiplayer and level themes of the full game. Includes 3 maps and many elements of the game that were either cut or changed for the final release. Further details can be found on Quake Wiki. Quake The original DOS version. Can only be run in MS-DOS (or DOSBox for newer systems). Fullscreen only. Quake (shareware) This version is the official demo for the game (besides Qtest). Only the first episode ("Dimension of the Doomed") is available to play. Fullscreen only. Also, the shareware PAK file can be downloaded separately from the main release (to be used with source ports). WinQuake This version is optimised to run under Windows 95/98 as an independent .exe file. Allows the game to appear in a window and screen resolutions can be selected in-game. QuakeWorld A multiplayer only version of Quake specifically designed to play over the Internet. A version using OpenGL rendering is also available (GLQuakeWorld). See Quake vs. QuakeWorld for specifics. VQuake The first hardware accelerated version of Quake, released shortly before GLQuake. This MS-DOS port is specifically designed for the Vérité chipset by short-lived company Rendition, using their proprietary Speedy3D API. Uniquely for the time, this version offered edge anti-aliasing, adjustable from 0 to 7, covering various combinations of world, object and particle polygons. As there is no emulation of this hardware available, this port cannot be played on modern computers. To install a source port, extract it into the same folder as the vanilla executable and run the modified engine's .exe. DarkPlaces DarkPlaces is a 2nd common port for new players which adds modern graphical features such as realtime shadowmaps, bloom, and normalmapping. It also supports both the netQuake, and QuakeWorld networking protocols, as well as its own. It scales well on visual effects from the modern to the classic and sports fast rendering for modern GPUs. It has some problems with mods that depend on the original Quake's bugs that the engine has fixed. DirectQ (Archived) DirectQ is a Direct3d oriented engine with a few tweaks to the menu but little to graphical improvements, it simply runs on DirectX instead of OpenGL. It mostly resembles the classic look with some quirks such as the HUD being based on Nintendo 64 version, outside of that it performs excellently. Note that this source port is no longer under active development. The latest release is v1.9. FTEQuakeWorld FTEQuakeWorld is targeted at QuakeWorld players while adding support for other Quake engine games. It features enhanced visuals, voice chat support, and better modding capability for QuakeWorld servers. nQuake nQuake is a complete QuakeWorld package, designed to quickly get into multiplayer with all the required features in a modern context. You can also optionally install a pack during installation to enhance the overall look of the game. ezQuake A more lean version of nQuake. QuakeSpasm QuakeSpasm is a descendant of FitzQuake which like that engine, it focuses on fixing bugs and stability, lifting engine limits such as maximum items and geometry detail and restoring the missing functionality that the original software renderer had but the OpenGL renderer lacked. Unlike many other engines, QuakeSpasm does not alter the style of the original game and doesn't fix game-changing bugs that affects mods. It also has native support for anti-aliasing [Note 1] and anisotropic filtering[Note 2]. The most commonly used source port in the community. By default, QuakeSpasm doesn’t play demo footage upon boot the way the original did; this behavior can be restored using the -fitz Command line argument. Ultimate Quake Patch Designed for the Steam version of Quake but is also compatible with retail versions by changing the install path of the mod. It includes Darkplaces along with the soundtrack. However, the source port included uses an outdated version and the Scourge of Armagon soundtrack is badly ripped. vkQuake vkQuake is a Quake 1 port using Vulkan instead of OpenGL for rendering. It is based on the popular QuakeSpasm port and runs all mods compatible with it like Arcane Dimensions or In The Shadows. Compared to QuakeSpasm vkQuake also features a software Quake like underwater effect, has better color precision, and generates mipmap for water surfaces at runtime. It is the current best source port for modern GPUs with Vulkan support. Mark V Forked from FitzQuake, Mark V also contains features from other source ports such as JoeQuake or ProQuake. Besides that it also has their own such as support for Nehahra mod, copy & paste in console, saving multiplayer games, external texture and .vis support, extended coop features, software mode inspired by WinQuake and many more. As for the music, it only supports CD audio and the external MP3 files. Quake "Epsilon" Quake Epsilon is a graphically enhanced build of shareware Quake 1 for Windows/Linux/Mac, which can be upgraded to the full version of Quake along with it's mission packs Scourge of Armagon and Dissolution of Eternity by copying the full-version .pak files into the correct folders. Quakespasm or vkQuake is recommended for authenticity to the original and maximum mod compatibility. DarkPlaces is recommended for graphical enhancements. Quake Injector is a Java-based client for the Quaddicted single player map and mod database that runs on Windows, OS X and Linux. It provides the ability to install and uninstall maps and mods (with their requirements/dependencies) from the site directly on Quake with a single click and includes information about each mod, such as release data, rating (from the Quaddicted editor), title, authors, a brief description (from the editor) and screenshot. Also it can (with varying levels of success) figure out if there are known maps already installed. Quake Injector does not provide access to every map released for Quake (it has no support for multiplayer maps, for example, unless they come as part of a singleplayer map pack or they are singleplayer maps in addition to multiplayer), but it is very close to that and provides an easy method to try new maps and mods. Please note that under OS X and Linux, many older maps will need manual editing of their filenames because the original files contained mixed case or upper case letters. MiniQL is a small Quake launcher that provides an easy front-end to running any user map or original map by scanning Quake and mod archive files (PAK files) and displaying all maps to select from. It can also be used to supply default variables (such as fov) and screen resolution when starting the game. MiniQL can be downloaded from here. Stretched from 4:3 only. A source port is required for proper widescreen. A source port is required for easy selection. For GLQuake, use +fov in the console, followed by the desired field-of-view. Limited native support. See Source ports. Frame rate is capped at 72 FPS by default. In-game screen resolution settings for DOS Quake. In-game screen resolution settings for WinQuake. In-game screen resolution settings for GLQuake. The game uses non-power of two textures for models, which were supported by the software renderer, but not by the OpenGL renderer. Therefore, textures in OpenGL have to be resized to a power of two; this is controlled through the console command gl_round_down. By default GLQuake has this set to 1, which downsamples textures to the nearest power of two, reducing quality noticeably in the process. This was used due to limitations of contemporary 3D hardware, although the readme for GLQuake claims that setting it to 0 (which will upscale to the next higher power of two instead) will run well even on a contemporary 4 MB 3DFX Voodoo Graphics. GLQuake also defaults to gl_flashblend 1, which uses a transparent shaded sphere around lightsources such as explosions in place of real dynamic lighting. Setting gl_flashblend 0 will use dynamic lighting similar to the software renderer. Forced on by default. See Source ports. To set mouselook to always on, add +mlook to autoexec.cfg. Using existing joystick support, it is possible to add support for XInput-based controllers. A list of configurations for the devices can be found in the Files section. It will not add triggers support for XInput-based controllers as Quake treats them as axes and won't allow to map them. As a workaround XInput-to-DirectInput wrapper can be used, such as XInput Plus (actual tool is in English). Use RiftQuake with r_oculusrift 1 command line argument. Use the FTE Quakeworld source port. For modern Internet support and other extra multiplayer-centric features, a source port is required. See Source ports. Pull down the console (~) and type connect <server address or ip>. Use DOSBox and mount the Bin/Cue image. The Steam version lacks the original soundtrack. Install Ultimate Quake Patch to restore music to the Steam version and add the features of the DarkPlaces engine. If you prefer to use the original engine you can download the soundtrack from the Steam forums. Either burn a new CD from the image file or use a CD emulator like WinCDEmu to mount the image. The GOG.com version includes the soundtrack, but by default it is only set up for use with the DOS version under DOSBox. Install a virtual CD software, e.g. WinCDEmu. Mount the CD images in the installation folder with WinCDEmu. Some Quake engines can play music files to give you a soundtrack during the game. Download the soundtrack files[Note 5] for the campaign and mission packs. Place id1, hipnotic, and rogue folders in the installation folder. The original OpenGL version of Quake may not run on some systems with Nvidia graphics cards. Search and open the game profile. Set Extension limit to On. Run Glquake.exe with the -no8bit command line argument. Edit Glquake.exe with a hex editor. Select the %s in that line and replace these two letters with two spaces. This happens with the incorrect CUE sheet that was included. It happens only with the main game and the Dissolution of Eternity. Scourge of Armagon is not affected by this. Download Fixed game.cue sheets for Quake The Offering. Unpack both of these files to the installation folder. Install patched _inmm.dll and open its main folder. Go to <path-to-game> and drag your game executable on _inmmconf.exe. Further explanations are available on gemot encubed. 1.0 The vkQuake source port is required. 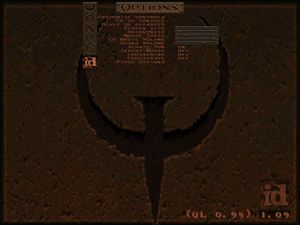 When Quake initially launched its netcode was not optimized for the dial-up connections of the time, and so consequently QuakeWorld was created, a separate exe for the game which was multiplayer only with adjusted physics and severely revamped netcode. As personal internet connections improved, the original Quake protocol became more relevant. 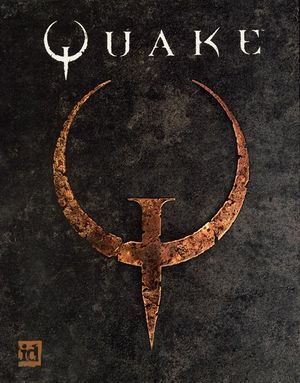 The original, non-QuakeWorld version, is now often referred to as NetQuake, and there is a divide as to which to play. Serious competitive players are very sensitive to the differences between them, however for the starting out player the differences will be barely noticeable, and the experienced but more casual players play whichever, simply going for servers where a fun time can be had. Was originally a Quake mod. Total conversion based on the animated X-Men TV series. Adds an number of interesting changes to gameplay as well as small aesthetic ones, such as footstep sounds. See here for details. List and discussions of additional texture packs can be found here. Use Vispatch (Mac version available here) to patch vanilla data (some mods already include said patches to data). Use the command r_wateralpha with any value below 1.0 to enable the effects. Note some engines won't remember this value and will require it to be added to the autoexec.cfg. A sound pack for April Fools can be found here, though it does little more than distort the audio. Mods are accessed via an amendment system, where you tell the engine where to look first for game data, and then it falls back to the default subfolder (id1) for the base game. The subfolder root for the mod will either have a progs.dat file, or a .pak or .pk3 file. Extract the mod from the compressed folder. If the mod does not come in a folder after extracting, create a new one and place all the mod files into it. Move the mod folder into <path-to-game>. Use the -game <folder containing the mod> command line argument. Most source ports provide bug fixes to the original Quake engine. Some of these fixes may break compatibility with certain mods, rendering them unplayable (unreachable items floating in the air, enemies falling out of the world, etc.). Many modern mods for Quake require a source port to run, as they break the original engine limitations (larger maps, more enemies, more scripting commands, etc.). Mod creators will state this requirement in the mod page or README file (if available). In the Id1 folder (located in the main Quake folder), create a folder named maps. Extract the map files (usually a BSP and a text file) from the compressed folder into the maps folder. For maps requiring mods to function, create the maps folder inside the folder for the mod. Use the +map <name of the BSP file (excluding the extension)> command line argument. Alternatively, the -map <name of the BSP file (excluding the extension)> command can be used in the in-game console (~). A complete list of console commands can be found on QuakeWiki. Note that not all of these may apply to all source ports. Experimental rendering features referenced in the GLQuake readme include r_wateralpha (0-1, default 1), with a recommended 0.7 for slightly translucent water. This is said in the readme to not work with standard maps, as they are not processed with this in mind (see transparent water). Shadows can be set with r_shadows 1, and mirrors activated with r_mirroralpha 0.3, which only affects one texture in the "easy" starting hall. ↑ Although the console command to enable anti-aliasing is vid_fsaa #, the anti-aliasing applied is only MSAA. This is particularly noticeable when coupled with gl_texturemode "gl_nearest_mipmap_linear". ↑ The console command to enable 16x anisotropic filtering is gl_texture_anisotropy 16. Can be combined with gl_texturemode "gl_nearest_mipmap_linear". ↑ 4.0 4.1 File/folder structure within this directory reflects the path(s) listed for Windows and/or Steam game data (use Wine regedit to access Windows registry paths). Games with Steam Cloud support may store data in ~/.steam/steam/userdata/<user-id>/2310/ in addition to or instead of this directory. The app ID (2310) may differ in some cases. Treat backslashes as forward slashes. See the glossary page for details. ↑ The tracks linked here have been processed with de-emphasis and may sound duller than the composer's intentions. ↑ machinegames on Twitter: "Happy 20th to Quake @idsoftware! As a gift to the fans, we created a new episode of the game"
↑ Quake GOG Tweak Guide - YouTube --- See top rated comment. Comparison in video. This page was last edited on 8 April 2019, at 10:49.